Tom WrightA lively, non-technical introduction to Jesus, what he stood for, and how hisfollowers learned to regard him as the human face of God. 160 pages, from Lion. Nearly 2000 years after his execution by the Romans, the enigmatic figure of Jesus Christ remains the subject of intense historical investigation. Theories about the significance of his life and vision continue to abound, as scholars of all religious persuasions try to make sense of the latest archaeological findings and the light they throw on the period in which he lived. ;Designed as an introduction, this book should help readers gain an insight into what Jesus really stood for, why he was killed, and how it was that his early followers came to regard him as nothing less than the human face of God. 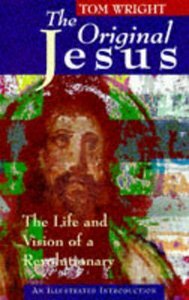 ;The book focuses on key stages in the life of Jesus, and key elements of his teaching - revealing a reconstruction of what Jesus himself was aiming to achieve, and how the movement he began can best be understood in relation to the turbulent politics and intense Messianic expectations of his day. ;Part Two looks at the way people interpret the Gospels, showing how readers coming fresh to these texts to do so in an intelligent and discriminating way. Tom Wright is the author of The New Testament and the People of God and Who Is Jesus?. Tom Wright provides a concise, accessible and visually attractive introduction to the historical Jesus and the essence of his message. N.T. (Tom) Wright (D.Phil., Oxford) has recently retired as Bishop of Durham, and is one of the most influential theologians in the world today. During his long and dynamic ministry career, Wright has successfully blended the roles of pastor, preacher, academic, and popular author. His prolific written output reaches a wide range of readers: his books The New Testament and the People of God; Jesus and the Victory of God; and The Resurrection of the Son of God are monumental works of New Testament scholarship, while his For Everyone commentary series brings the Bible alive for a popular audience. Wright is currently Research Professor of New Testament and Early Christianity at the University of St Andrews in Scotland.